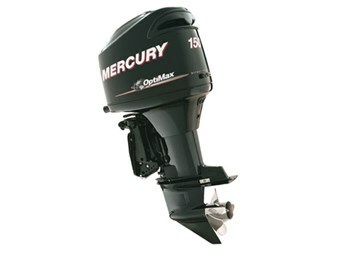 The Mercury Marine 150 OptiMax sits in the middle of three, direct fuel-injection two-strokes from 135 to 175hp, all of which use the same 60° V6 powerhead. The 2.5lt loop-charged powerhead has been around a long, long time and in my opinion is one of Mercury’s best-ever engines. In carburetted and EFI form, it can develop up to 200hp. The combination of a relatively low WOT (wide open throttle) range — from 5250 to 5750rpm — plus big-cylinder-bore-and-short-piston-stroke ensure a long lifespan. I’ve even tried a race version running on Avgas and this pushed us to 84kts (155kmh) in a 5.5m skiboat on the upper Hawkesbury River. Unlike some of its four-stroke competitors, the 150 is a true marine engine with a diecast alloy cylinder block and head designed to handle the rigours of direct saltwater cooling. Spare parts are readily available and Mercury even offers a rebuild programme for the powerhead. As with all OptiMax engines, the 150 utilises the Orbital Engine Corporation of WA dual-stage OCP (Orbital Combustion Process) direct-injection, with stratified and homogenous modes. This differs from the Evinrude E-TEC system in that it injects atomised air and fuel rather than just straight fuel via unit injectors, as occurs in a direct-injection car engine. At low revs (below 1500rpm or thereabouts) the air/fuel mix, which has fuel droplets down to only five microns, is injected directly at the spark plug in a narrow conical pattern. This creates the normal air/fuel ratio of 14.7:1. However, this is as lean as 70:1 overall in the combustion chamber. Above 1500rpm the overall air/fuel ratio increases to generate the torque needed to plane a hull. Combined with fuel/oil ratios varying from 44:1 at WOT down to 400:1 when trolling, the 150 is very economical for its output. The standard in-boat oil tank holds 11.4lt. At 201kg in extra-longshaft (25in) the 150 is much lighter than any of the direct four-stroke competition. I tested one on an Archer 58C plate-alloy cuddy cabin, pushing a total of 1350kg and spinning a 19in Quicksilver Mirage stainless steel prop. During the test I felt the demo 150 was slightly over-propped and could have done with a 17in prop. Even so, it performed flawlessly with low vibration levels across the entire rpm range and scarcely any harmonics through the hull structure. The holeshot acceleration was matched only by other 150hp DFI two-strokes and only when I poured on the power did the typical Mercury V6 "howl" become noticeable. However, the 150 was still noisier overall than the four-stroke competition. Through full-lock figure-of-eight turns at 4000rpm there was absolutely no prop ventilation – quite an achievement on a plate-hull with a long external keel. Hot or cold, the 150 started instantly with no oil smoke appearing at any time, nor was there an oil smell when backing upwind. But the Mercury control box shifting action was "notchy" and should be improved. Providing the anti-ventilation plate was kept at least three quarters immersed, power astern was good and no cooling-water starvation occurred. When trolling, the fuel consumption was comparable to that of a 60hp four-stroke outboard and a carburetted 25hp two-stroke. Best of all, after one hour of performance testing the 150 had used only 9.5lt – a superb figure for any 150hp outboard.